These three companies offer up huge dividend yields, but only one is worthy of your capital. With interest rates low, many people have turned to the stock market to generate a decent yield. While we Fools largely applaud that decision, we are firm believers that investors need to be highly selective about which income stocks they choose to buy. With dividend yields that currently exceed 5%, AstraZeneca (NYSE:AZN), Guess? (NYSE:GES), and Welltower (NYSE:WELL) are all likely to attract any dividend investor's attention. However, I think that only one of these stocks is truly worthy of your investment dollar. Can they plug the revenue hole? AstraZeneca is a household name; the company sells a number of drugs that you might be familiar with. Crestor has been helping patients bring their cholesterol levels under control for years, while Nexium has been the Purple Pill that millions turn to when they need heartburn relief. These drugs are highly popular and helped drive AstraZeneca's top line higher for years. With a dividend yield of 6.35% and a recession-resistant business model, you might assume that AstraZeneca is a great choice for income investors today. Unfortunately, I don't think that's the case. Every pharma investor knows that blockbuster drugs can be a double-edged sword. Once patent protection disappears, generic competition enters the fray and revenue can evaporate in a flash. That's the situation that AstraZeneca has been dealing with for a few years now. In 2016, U.S. sales of Crestor and Nexium fell by 57% and 39%, respectively, which was a major reason that total revenue dropped by 7%. While the company was able to cut expenses enough to drive a 1% increase in core EPS (earnings per share), that's not a situation that can last forever. Management is aware of the issue and has several drugs in the pipeline that could one day return the company to growth. However, it will still be some time before those drugs hit the market. 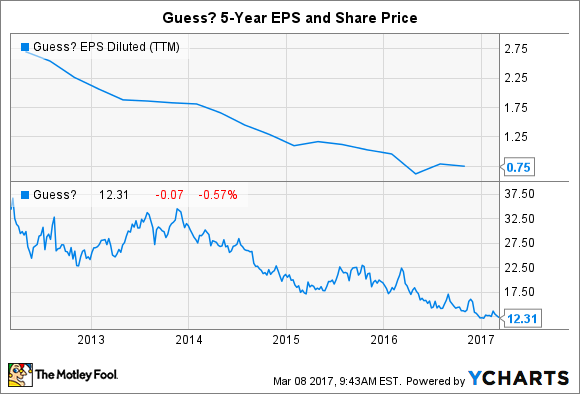 That's why management is projecting that revenue will decline by "low-to-mid" single digits in 2017 and EPS will drop by the "low-to-mid teens." While a fat yield is tempting, investing in a company with declining revenue and profits is rarely a good idea. That makes this a pharma stock that I plan on keeping far away from. GES EPS Diluted (TTM) data by YCharts. The drop has pushed the dividend yield up to a mouthwatering 7.2%. Does that make it a good time to buy into this beaten-down stock? While a turnaround for Guess? is always possible, I don't like its chances of success. Recent results show that the company is posting decent revenue gains in Europe and Asia, but it's struggling in the Americas: Same-store sales in the region dropped by 4.9% last quarter while licensing revenue dropped by 14%. Even more troubling is that margins were weak, which had a serious impact on profits. Management isn't expecting fortunes to turn around in the near term, either. For 2016, Guess? expects top-line growth of just 0.5% to 1.5%, while adjusted earnings are expected to land between $0.42 and $0.52 per share. That's a $0.20 drop from its prior prediction. The cut in EPS guidance should raise income investors' eyebrows. Currently, the company's annual dividend payment is $0.90 per year. That means that Guess? will have to dip into its piggy bank to make up the difference. While its cash-rich balance sheet can easily cover the shortfall, it's unclear whether or not Guess? can reverse course in the Americas and Asia. Since orchestrating a turnaround in the fashion industry is notoriously difficult to pull off, this former shareholder plans on keeping far away. Like AstraZeneca and Guess?, Welltower is another high-yield stock facing some short-term challenges. However, I have far more confidence in the future of Welltower than I do in the other two businesses. Welltower is one of the largest owners of healthcare properties in the U.S. The company is structured as a real estate investment trust, or REIT, and it has built a small empire of buildings that cater to the needs of senior citizens. Welltower owns assisted-living facilities, senior-living communities, memory-care facilities, and more. Given the country's aging population, the long-term demand profile for these facilities looks bright. Given that backdrop, you might be scratching your head as to why Welltower's funds from operations -- for REITs, a proxy for earnings -- declined last quarter. Even more puzzling is why funds from operations are expected to decline by more than 7% in 2017. What gives? Thankfully, there's a simple explanation for the fall. Welltower has been selling off facilities that depend on Medicare and Medicaid in favor of those that are funded by private payers. This decision is designed to reduce the company's exposure to public payers, a move that I approve of given today's politically charged healthcare environment. Currently, private-pay revenue now comprises 93% of the company's total revenue. That's a big jump from 69% in 2010. Looking ahead, I'm willing to bet that its focus on senior facilities and private-pay facilities will allow the company to continue its trend of regular dividend increases. With a market-topping yield of 5.3% and long-term growth prospects in place, Welltower should give investors seeking healthy yields a reason to take a closer look.